Rubber Room Ramblings: SEEING DOUBLE? 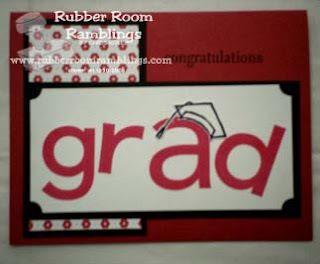 I posted this Graduation card that we made at my Friday club last week, and I know you were all totally awed by its beauty! 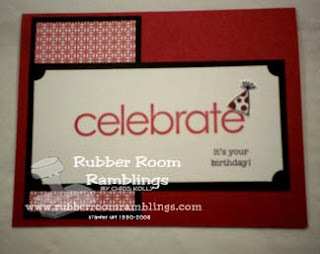 I always prepare a few extra card kits (just in case), and I knew I would not be needing any more graduation cards, so I used the same materials, switched the graduation cap for a birthday hat, put the "celebrate" stamp on the outside instead of the inside and turned it into a birthday card. So, for all of you reading this that always say you have to copy everything, I urge you to venture just a little bit off the track and come up with something that's the same, but different!